The affenpinscher is a compact toy dog that's expressive and alert. This breed has a cute, almost "monkey-like" appearance—long, shaggy fur surrounds their faces and forms a cape on their head and shoulders. The affenpinscher is an older dog breed that likely originated from Germany and surrounding areas of Europe. Affenpinscher translates as "monkey-terrier" in German, which comes from their monkey-like appearance. Affenpinschers were originally somewhat larger dogs that were once used to hunt rats in homes and around farms. They were bred down in size over the years, but much of the hunter's instinct still remains. Some speculate that Affenpinschers are a result of crossing pugs and German pinschers. They're also thought to have contributed to the bloodlines of the Brussels griffon and the miniature schnauzer. Affenpinschers first gained a breed standard with the Berlin Lapdog Club in 1913. They were then recognized by the American Kennel Club (AKC) in 1936 but unfortunately there was little interest due to World War II. Breeding was revived in the 1950s but today the affenpinscher remains a rare dog. If you set your heart on one, you'll likely need to add your name to a long waitlist. Relatively frequent grooming is necessary for this breed's coarse, rough coat. Grooming routines primarily consists of regular brushing, but the breed benefits from occasional trips to a professional groomer. In general, the Affenpinscher's coat is shaggy but not unkempt in appearance. You may need pluck hairs that grow in the corners of their eyes so it doesn't cause irritation. Affenpinschers do not shed much, making them an ideal pet if you want less dog hair on your clothing and furniture. Because of their minimal shedding, some consider the breed to be hypoallergenic, but allergens still remain in their dander and saliva. You should help your dog with dental hygiene by brushing his teeth daily to prevent periodontal disease. Trim your dog's nails every couple of weeks or whenever you hear clicking when he walks on hard surfaces. Though not considered hyperactive, affenpinschers have a fair amount of energy and should receive routine exercise. At minimum, this dog requires a daily walk but the ideally they take two or three. You'll need to monitor your dog when exercising (especially on warmer days) as this breed can easily overheat due to their short, stubby noses. They should be kept indoors but they enjoy having access to a fenced yard for play. They require supervision on walks or at a dog park as they're known to confront much larger dogs. Sometimes they're unaware of their small stature and appear to think they're big dogs themselves. The affenpinscher is a curious, intelligent dog that can have a stubborn and feisty streak. Firm and consistent obedience training and proper socialization are essential. This practice will help you fine-tune the breed's natural talents as a loyal watchdog and hunter. You will need to socialize an affenpinscher from a young age as they are naturally suspicious of strangers. While most are not problem barkers, an affenpinscher can take awhile to settle down and stop yelping once triggered. Affenpinschers may not be ideal matches for children or other pets, but some are more adaptable with training and socialization. They don't tolerate being teased or handled roughly by small children. As a toy dog, they can be easily injured. They have a natural inclination to hunt rodents, so they're not a good fit for households with gerbils or guinea pigs and they may even chase after cats. This breed can be difficult to housebreak—be sure to have plenty of puppy pads and cleaning supplies on hand when going through the process. Luckily, with consistency and lots or patience, even the most stubborn affenpinschers will eventually learn to eliminate outdoors. As a toy dog, your affenpinscher won't need much food. Two meals a day of up to 1/4 cup of dry dog food will be sufficient. The amount will vary by the dog's size, age, and activity level. Your dog's needs will change throughout his lifespan. Monitor your dog for any weight gain as even one extra pound is significant for a tiny dog. Being overweight or obese will shorten your dog's lifespan and predispose her to many health conditions. If you note any weight gain, discuss it with your veterinarian to get recommendations for feeding schedules, amount of food, type of food, and exercise. These organizations will be able to provide guidance and next steps for adoption. 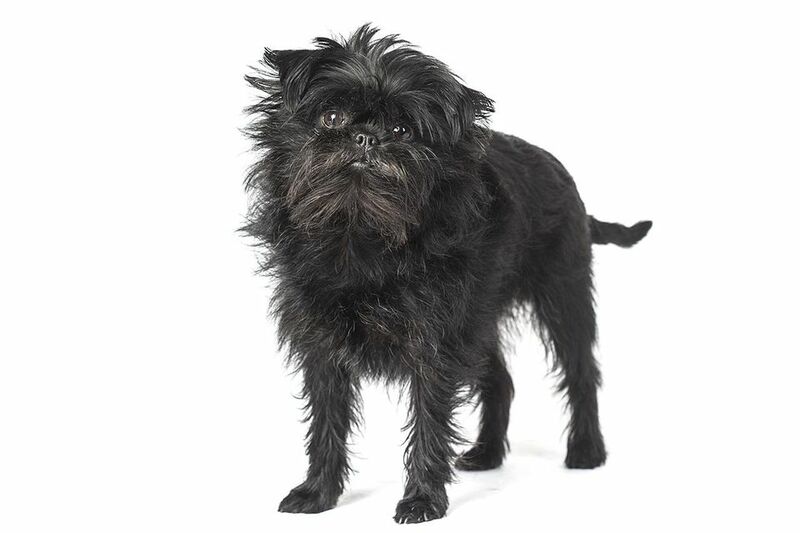 If you aren't certain the breed is right for you, you may be able to try fostering an affenpinscher to test if the dog is a good fit for your home. Before you decide to adopt an affenpinscher, be sure to do plenty of research. Talk to other affenpinscher owners, reputable breeders, and rescue groups to learn more.